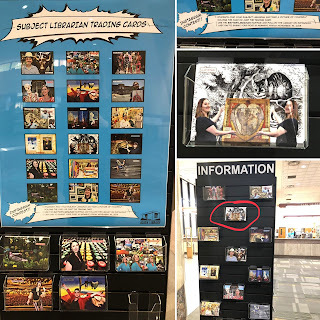 Humanities @ Alkek: Subject Librarian Trading Card Instagram CONTEST - Ending Soon! Are you studying English, Philosophy, or Modern Languages? Do you love free library swag? Alkek Library is hosting a Subject Librarian Trading Card Contest, and the deadline is SOON (November 16th, 11:59PM). Psssssst.... Guess what? I'm your Subject Librarian! Let's give the other Departments a run for their money! This is a short contest, so you have a very good chance of winning some Alkek Library swag! I'll even throw in an extra prize if a student in one of my subjects wins! Shhh... don't tell anyone. Grab my trading card the next time you're in Alkek Library! (It's in the information stand located near the staircase on the main floor.) Hint: Look for the Cheshire Cat! Post a picture of you with my card (or just a picture of the card itself). Tag @alkeklibrary and use #myTXSTlibrarian in your post. We'll randomly select a winner and announce on the following Monday!